PORTLAND, OR -- Oregon’s statewide snowpack is currently 74% of average, but the Natural Resource Conservation Service says that figure does not tell the whole story. Scott Oviatt, with the agency, says basins in the northern portion of the state are very close to normal for this time of the year. But, as you move south, snowpack drops to below 70%, and in some areas, it’s 50% of average. Click HERE for the latest numbers. 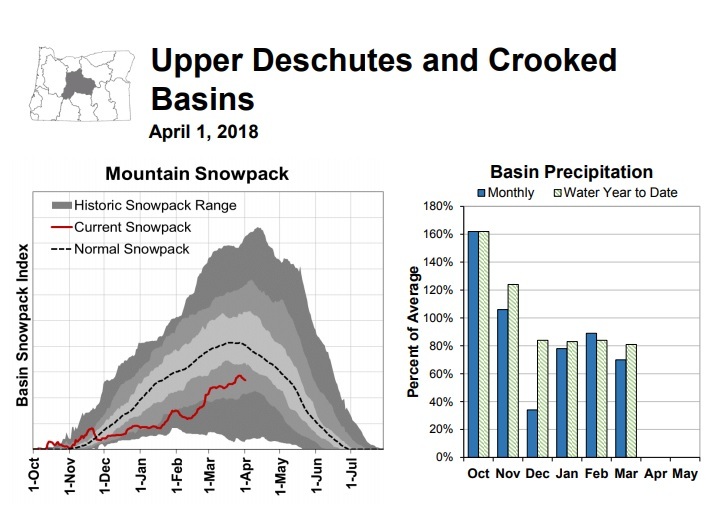 “People that need to be concerned are those who are reliant on surface and stream flows because we are fully anticipating lower stream flow volumes than we normally see, due to lack of snowpack feeding into those systems.” As of April first, the Upper Deschutes and Crooked River Basins are at 66% of average. On the positive side, Oviatt says many of the state’s reservoirs are near 100%, which indicates good water supplies for irrigation.